This article is about the painting by Paul Delaroche. For the painting by Jacques-Louis David, see Napoleon Crossing the Alps. Bonaparte Crossing the Alps (also called Napoleon Crossing the Alps, despite the existence of another, more well-known painting with that name) is an 1848–1850 oil-on-canvas portrait of Napoleon Bonaparte, by French artist Paul Delaroche. The painting depicts Bonaparte leading his army through the Alps on a mule,[I] a journey Napoleon and his army of soldiers made in the spring of 1800, in an attempt to surprise the Austrian army in Italy. The two main versions of this painting that exist are in the Louvre in Paris and the Walker Art Gallery in Liverpool, England. Queen Victoria also obtained a reduced version of it. The work was inspired by Jacques-Louis David's series of five Napoleon Crossing the Alps paintings (1801–1805). David's works also show Napoleon's journey through the Great St. Bernard Pass, but there are significant stylistic differences between the two conceptions. Delaroche's Napoleon is cold and downcast, whereas David's wears a pristine uniform, and is idealized as a hero. Delaroche was commissioned to paint a realistic portrait; the style of which was emerging at the time. While the painting largely represented—and was one of the pioneers of—an emerging style, the work was criticised by several authorities on the subject. The reasons for this varied from Delaroche's depiction of the scene to a general disapproval of Delaroche himself. Many of those who were in the latter state of mind felt that Delaroche was trying to match the genius of Napoleon in some way, and had failed miserably in doing so. Battle of the Pyramids (1798–1799) by Francois-Louis-Joseph Watteau depicts the battle of the same name, which occurred during Napoleon's Egyptian campaign. 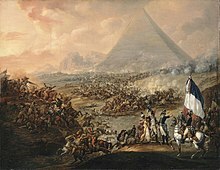 As part of his 1798 campaign during the French Revolutionary Wars, Napoleon prepared to invade and conquer Egypt, which was at the time a province of the Ottoman Empire. Such a military action promised numerous benefits, including securing French trade interests, and inhibiting British access to India. By 1 July 1798, Napoleon had landed on the shores of Egypt. After a lengthy chain of conflicts with heavy casualties, the campaign resulted in an Ottoman-British victory. Napoleon received news from France that Austrian forces had retaken Italy and he decided to return to Paris. In order to regain the upper hand, he planned to launch a surprise assault on the Austrian army stationed in the Cisalpine Republic. Based on the assumption the Austrians would never expect Napoleon's large force to be able to traverse the Alps, he chose that as his route. He selected the shortest route through the Alps, the Great St Bernard Pass, which would enable him to reach his destination as quickly as possible. On 15 May 1800, Napoleon and his army of 40,000—not including the field artillery and baggage trains—(35,000 light artillery and infantry, 5,000 cavalry) began the arduous journey through the mountains. [II] During the five days spent traversing the pass, Napoleon's army consumed almost 22,000 bottles of wine, more than a tonne and a half of cheese, and around 800 kilograms of meat. Delaroche's "Napoléon abdiquant à Fontainebleau" ("Napoléon abdicated in Fontainebleau"), 1845 oil-on-canvas. Following his crossing of the Alps, Napoleon commenced military operations against the Austrian army. Despite an inauspicious start to the campaign, the Austrian forces were driven back to Marengo after nearly a month. There, a large battle took place on 14 June, which resulted in the Austrian evacuation of Italy. Delaroche's early works had been based on topics from the Bible's Old Testament, but gradually his interests switched to painting scenes from English and French history. He 'combined colouristic skill with an interest in detailed scenes from history'.Bonaparte Crossing the Alps, which was painted roughly eight years before Delaroche's death, exemplifies this phase in Delaroche's career. 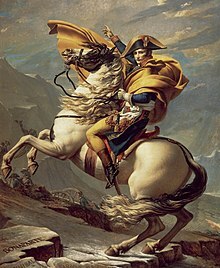 The commissioning aside, Delaroche was inspired to create Bonaparte Crossing the Alps because he felt that he both looked like Napoleon, and that his achievements were comparable to Napoleon's. It is likely that Delaroche's painting is relatively historically accurate; details such as Napoleon's clothes appear to have been researched by Delaroche in an effort at authenticity. Jacques-Louis David's version of the scene differs a great deal from Delaroche's idea of Napoleon's crossing of the Alps. The Liverpool painting was commissioned by Arthur George, Third Earl of Onslow, after Delaroche and George reportedly visited the Louvre in Paris, where they saw David's version of the famous event. It had only recently been re-hung in the museum after a resurgence of interest in Napoleon, nearly 40 years after he was exiled. [IV] Agreeing that the painting was unrealistic, George, who owned a sizable collection of Napoleonic paraphernalia, commissioned Delaroche to create a more realistic depiction. Elizabeth Foucart-Walker asserts that in fact the painting that hangs in the Louvre was produced first as it was already in America by 1850, when the Liverpool painting was produced. Stephen Bann suggests that Arthur George's meeting with Delaroche may have occurred, but Delaroche chose to produce two works that are almost identical and send one to America. The Liverpool version of the painting is more refined. The contrast between Jacques-Louis David's depiction of the same scene (of Napoleon traversing the Alps on his way to Italy), which was a flattering portrait that the king of Spain requested[V] for Napoleon (as a gift) and Delaroche's depiction in Bonaparte Crossing the Alps is easily apparent. The first and most significant difference is in Napoleon, in his clothing, and in his general stature. David's version depicts Napoleon, dressed in an immaculate, multi-coloured uniform with a billowing cape. Delaroche's version, however, sees Napoleon in a fairly ordinary, gray coat with the sole purpose of keeping the cold away, rather than showing him as the symbol he may have represented - that of a gallant and powerful war leader, which is the impression given in David's version. However, there is another significant difference in Napoleon himself, in the way he holds himself. David's Napoleon is flamboyant, confident in his leadership of the French army, and in his ability to cross the Alps and defeat the Austrians in Italy. Delaroche's Napoleon is instead downcast, gaunt and embittered by the harsh cold. His eyes and expressionless face evidence his weariness, his tiredness a result of the long and unstable trek. The last properly significant difference in the two art works (excluding the actual setting, background, men seen in the distance etc.) is the difference in the animals that Napoleon rides on. In David's version, Napoleon rides a large, strong steed with a long mane, and this is one figment of David's version that is irrefutably untrue - Napoleon is known to have ridden a mule on his journey (which was borrowed from a local peasant), rather than a horse. This presence of a horse rather than a mule was one of the most major grounds for Delaroche's criticism of David's version, and is the basis of Delaroche's claim that Bonaparte Crossing the Alps, which includes a mule, is a more realistic portrayal of the scene. That face ne'er wore such blended might and need! —  H.T. Tuckerman's poem, describing Delaroche's portrayal. Napoleon is seen wearing clothing appropriate for his location: over his uniform he wears a long topcoat which is wrapped firmly around him, in which he keeps his gloveless right hand warm. He retains a piece of his dignity in the gold-trimmed black bicorne he wears on his head. The mule Napoleon rides is undernourished, tired from its ordeal in struggling through the Alps. On the left of the mule is his guide, Pierre Nicholas Dorsaz, who must constantly push himself and the mule forward, and who leans heavily on the shaft of wood he clutches in his left hand to allow himself to continue moving forward. His clothes are weather-beaten, his face ruddy from the cold. He is not allowed the luxury of riding an animal, for he must be able to navigate independently, on the ground. Elements of the cold, harsh environment of the Alps are apparent: distant mountains capped in snow rise up behind Napoleon and his troupe, while a steep cliff face appears on his left, and the path underfoot has a thick layer of ice. More members of Napoleon's entourage can be seen slightly behind him, their robust figures accentuating Bonaparte's fragility. Napoleon is shown to be as he would have been high up in the mountains, as a mortal and imperilled man. While this seems in some way demeaning to Napoleon's figure (and contrasts in the extreme with David's version, which shows Napoleon impervious to the cold, and in a heroic light), Delaroche's artwork was not intended to portray him in a hostile or unbecoming way. 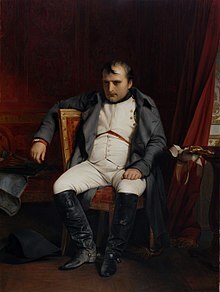 Delaroche wanted to depict Napoleon as a credible man, who suffered and underwent human hardship too, on his most daring exploits, and felt that making him appear as he really would have been in the situation would by no means debase or diminish Napoleon's iconic status or legacy, but rather make him a more admirable person. The amber light strikes Napoleon, introducing a level of contrast. Along with the mass of white seen behind Napoleon, the amber sunlight glow, originating from the West of Napoleon's troupe, is the central source of lighting in the painting. It introduces contrast when coupled with shadow, and, by illumination, highlights key aspects of the scene; this is particularly seen by the light that falls across Bonaparte's pigeon chest. Napoleon and the mule he is saddled on are richly textured visually by the contrasting light and shade, as is the guide leading the mule. The ice and snow layers, also, are made whiter by the sunshine from the West, brightening the whole scene. However, the overhanging cliff on the left of Napoleon's guide and the legs of the mule both cast shadows to balance the lighting scheme of the painting. The textural hues and schemes that Delaroche uses in this painting are quite detailed and well considered, especially in regards to the most important figures; such aspects of the work were described as being '...rendered with a fidelity that has not omitted the plait of a drapery, the shaggy texture of the four-footed animal, nor a detail of the harness on his back'. The mule, especially its fur, was intensely textured and detailed to make it look visually rough and bristly, and the mule itself weary and worn. The same techniques were applied to the red and yellow adornments draped and hung over the animal. The central detail of Napoleon is applied to his coat, in its ruffles and creases. Much detail and textural diversity is given to the guide too, most particularly to his face, his green, wind-caught tunic, and his leather boots. Delaroche's attention to detail and literal precision in this painting evidences and demonstrates the slow but steady evolution of realism in art during the 19th century, and how its popularity began to rise. The work, despite its attempt to depict Napoleon realistically, was criticised by several authorities for a variety of reasons. A few disapproved of Delaroche's choice of painting, while others disapproved of Delaroche himself, saying, in some form, that he sought the genius of Napoleon, to no avail. An Officer in a French costume, mounted on a mule, is conducted by a rough peasant through a dangerous pass, whose traces are scarcely discernible through the deep-lying snow; and his aide-de-camp is just visible in a ravine of the towering Alps. These facts are rendered with a fidelity that has not omitted the plait of a drapery, the shaggy texture of the four-footed animal, nor a detail of the harness on his back. The drifting of the embedded snow, the pendent icicle which a solitary sun-ray in a transient moment has made-all are given with a truth which will be dear to those who exalt the Dutch School for like qualities into the foremost rank of excellence. But the lofty and daring genius that led the humble Lieutenant of Ajaccio to be ruler and arbiter of the destinies of the larger part of Europe will be sought in vain by M. Delaroche. These all reveal a modification in his style, but not a happy one. His more recent works are not calculated to restore him the sympathy he had lost. It must be confessed that Delaroche is an artist of talent rather than a genius. Education and diligent study qualified him to be a painter, but not an artist, in the true sense of that word. For he has failed in the true mission of the artist-that of advancing the education of the masses; when it was in his power to give an impulse, he yielded to it; he has been a reflection, but not a light; and instead of elevating the public to himself, he has lowered himself to the public. Here, in David's version, Napoleon wears a colourful, pristine garb, complete with a billowing cape. Napoleon's mule is led along by Napoleon's peasant guide. The effect of the amber light is again evident here. Close detail of Napoleon's face, and that of his horse, from David's version. I ^ Bonaparte chose to ride across the alps on a mule (obtained at a convent at Martigny) rather than a steed, the typical gentleman's mount at the time, because the mule was considered to be more sure-footed on the slippery slopes and narrow passes of the Alps, and to be more sturdy and hardy while making such a perilous journey on such volatile terrain. II ^ Napoleon ordered the assemblage of over 5,000 artillery for transport through the pass, despite the fact that the pass was widely considered to be much too narrow, and the route too volatile and unstable, to allow any form of artillery, light or heavy, to come through. Thus, Napoleons military advisers warned him against this move, but he insisted on this presence of this great number of artillery. III^ In addition to these figures, approximately 3,600 French men were wounded, with over 900 captured or missing, and almost 5,520 Austrians were wounded, with over 2,900 captured (missing numbers cannot be accurately estimated). IV^ The painting was rehung as a result of the revival of Napoleon's reputation, and a fresh interest into his exploits. However, before this, in 1815, the year Napoleon was exiled, Napoleonic-themed art was proscribed for artists and painters, as he was not well liked because of events that had occurred in the few years immediately preceding 1815, and Napoleon's exile. It was only truly by the 1830s that artwork related to the emperor was being created once more. As such, after being removed from the walls of the Louvre around 1815, David's version had been re-hung by the time Delaroche observed it. V^ The king of Spain (of the time) commissioned Jacques-Louis David's Napoleon Crossing the Alps as a friendly gesture towards Napoleon, hoping that the flattering gift would strengthen relationships between France and Spain, to the degree that Napoleon would not consider invading Spain and taking it over, after he became emperor. However, the king of Spain's attempt failed, and, soon after Napoleon crowned himself emperor, he crossed the Pyrenees and conquered Spain. VI^ The Athenæum was a widely read literary magazine or periodical that was published in London between 1828 and 1923. Published weekly, the Athenæum grew and expanded to become one of the most influential and most widely read periodical of the Victorian era. Most of its content was composed of articles, reviews, and scientific and political news, among others. The topics covered in these texts included works of literature, fine art, music and theatre, science and politics. ^ a b c d e "'Napoleon Crossing the Alps', Paul Delaroche (1797-1856)". Archived from the original on 22 November 2008. Retrieved 11 August 2007. 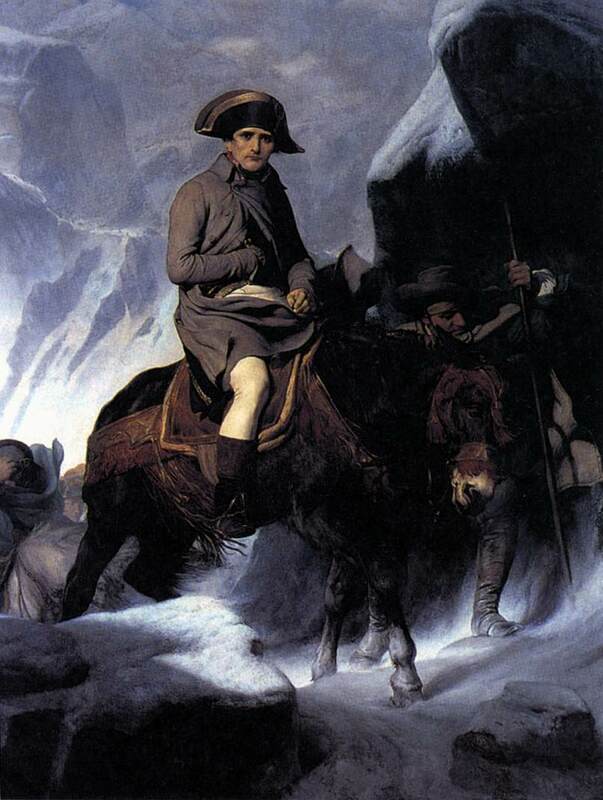 ^ a b c "DELAROCHE, Paul - Bonaparte Crossing the Alps". Retrieved 5 August 2007. ^ "Bonaparte Crossing the Alps 1848". Archived from the original on 2011-07-07. Retrieved 5 August 2007. ^ a b "Napoleon's Crossing over the Great St. Bernard Pass". Archived from the original on 2007-09-29. Retrieved 8 August 2007. ^ a b "History of the Great St Bernard pass". Archived from the original on 8 December 2012. Retrieved 8 August 2007. ^ "The Death of Elizabeth I, Queen of England (source on Delaroche's style)". Retrieved 5 August 2007. ^ "Artwork of the Month (Jan. 2006) at liverpoolmuseums". Archived from the original on 29 September 2007. Retrieved 8 August 2007. ^ a b "Napoleon's Rise To Power At Clark". Archived from the original on 27 September 2007. Retrieved 11 August 2007. ^ a b "'Napoleon crossing the Alps' 1850". Archived from the original on 29 September 2007. Retrieved 11 August 2007. ^ Chandler, D. G. p.51. ^ "Correspondance de Napoléon - Octobre 1801" (in French). Retrieved 6 August 2007. ^ a b "The Athenæum". Retrieved 9 August 2007. ^ Smith, D. The Greenhill Napoleonic Wars Data Book. Greenhill Books, 1998. ^ a b "The Athenaeum Projects: Overview". Retrieved 9 August 2007. Alison, A. History of Europe from the Commencement of the French Revolution in MDCCLXXXIX to the Restoration of the Bourbons in MDCCCXV. W. Blackwood and sons, 1854. Britt, A.B. The Wars of Napoleon. Square One Publishers, Inc., 2003. ISBN 0-7570-0154-8. Bunbury, H.E. Narratives of some passages in the great war with France, from 1799 to 1810. 1854. Chandler, D. G. Napoleon. Leo Cooper, 2002. ISBN 0-85052-750-3. Herold, J.C. The Age of Napoleon . Houghton Mifflin Books, 2002. ISBN 0-618-15461-2. Jefferies, F. The Gentleman's Magazine. Published 1856. The American Whig Review, by the Making of America Project. Published first in 1845. Quilley, G.; Bonehill, J. Conflicting Visions: War and Visual Culture in Britain and France, C. 1700-1830 Ashgate Publishing, Ltd., 2005. ISBN 0-7546-0575-2. Thiers, M.A. History of the Consulate and the Empire of France Under Napoleon. Kessinger Publishing, 2005. ISBN 1-4179-5621-6. Tuckerman, H.T. Poems. Ticknor, Reed, and Fields, 1851. Walther, I.F. ; Suckale, R. Masterpieces of Western Art: A History of Art in 900 Individual Studies Taschen, 2002. Wikimedia Commons has media related to Paul Delaroche.